Australia is the top destination chosen by gap year travellers. New research by the Association of British Travel Agents (Abta) shows far-flung parts of the globe are most popular with British students seeking to bridge the gap between the conclusion of further education and the next step - be it university or employment. 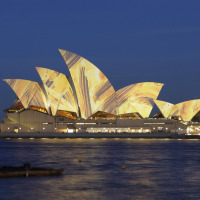 According to Abta, Australia is the most sought-after destination, followed by Thailand and the US. None of the top 10 places are in Europe, with Peru and Vietnam also featuring in the five most-desired destinations. The list is completed by New Zealand, Laos and Cambodia, Colombia, east Africa and India, while Japan and Indonesia have seen an upturn in recent interest and could be popular with next year's leavers, experts predict. Some Abta members specialising in gap year travel report increases of more than 20% in bookings over the last 12 months, with Australasia, south-east Asia, the US and South America being the most popular destination choices. Nikki White, for Abta, said: "A gap year should be one of the most memorable and formative events in the lives of the thousands of young people who will be heading off overseas in the next 12 months. "Foreign travel can present a range of challenges, especially in less affluent countries, and it is incredibly important that gap year students do their research and plan in advance so they can travel safely and get the most out of their experiences." Travellers are being warned not to leave insurance as an "afterthought", as they could be left with a bill for emergency medical treatment abroad that is higher than the price of a house. The Association of British Insurers (ABI) says travel insurers help more than 3,000 travellers every week who need emergency medical care while they are abroad. ABI have stressed the importance of taking out trusted travel insurance to avoid being left with a hefty bill and ruining your trip.